The first Humphreys-designed Tempus 90 was launched by Arkin Pruva Yachts in August and christened Tempus Fugit, and she was soon put to the test racing in both the Regates Royales - Panerai Trophy in Cannes and the Les Voiles de Saint-Tropez before the end of the Mediterranean season, even if the Regates Royales was in some ways an extension of her sailing trials. Boat International had the opportunity to join her during Les Voiles and see this J Class-inspired beauty test her mettle against the carbon machines in her class. Tempus Fugit performed 'beyond expectations' during her first two regattas. Proving she could hold her own in a class of predominantly carbon-crafted racers and racer cruisers during Les Voiles de Saint-Tropez, she finished with a joint fifth place in the 23-boat IRC Class A. The low deckhouses of the Tempus 90 echo traditional J Class styling, but the freeboard is higher and the 5.6m-beam relatively wider, allowing larger accommodation and a more practical live-aboard interior. 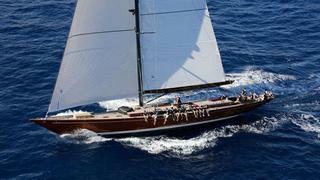 Tempus Fugit is cold moulded with epoxy resin, and her mahogany wood hull is varnished. This makes her a head-turner on the race course, and passerby were seen literally stopping in their tracks as they walked the dock to get a better look at the gleaming wood hull. Her rig is a contemporary sloop with slab reefing, swept back spreaders, a short top mast, fixed backstay and self-tacking headsail option for cruising. Stay tuned for a full feature on Tempus Fugit in a future issue of Boat International and on this site.